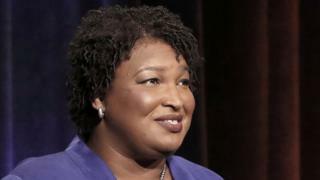 Georgia gubernatorial candidate Stacey Abrams has recognised her rival's victory while announcing a plan to sue the state. Ms Abrams, the Democratic challenger to Republican Brian Kemp, said this was not a "concession" but an acknowledgement she could not win. The candidate announced she would file a federal suit against Georgia for "gross mismanagement" of the vote. Mr Kemp, however, declared the election "over". "We can no longer dwell on the divisive politics of the past but must focus on Georgia's bright and promising future," he said shortly after Ms Abrams' speech. The Republican served as Georgia's secretary of state before the race, putting him in overall charge of elections. Ms Abrams and civil rights groups accused Mr Kemp of purging thousands from voting rolls in that capacity. "This is not a speech of concession, because concession means to acknowledge an action as right, true or proper," Ms Abrams told her supporters in a speech on Friday. "In the coming days, we will be filing a major federal lawsuit against the state of Georgia for the gross mismanagement of this election and to protect future elections." Mr Kemp declared his victory shortly after the vote on 6 November, but the Democratic candidate's campaign team launched a legal challenge to ensure all ballots were counted. Ms Abrams ran as the first black female nominee for governor in the US. The election result has been in doubt for 10 days. In Florida, volunteers are conducting a legally required hand recount of votes in that state's acrimonious senatorial contest. Incumbent Democratic senator Bill Nelson is up against Republican governor Rick Scott.